10:03 pm--According to Ken Littleton, when interviewed by Willis Krebs on 9/12/94, Tommy joined him in the master bedroom to watch The French Connection on television at around this time. "He came up," Littleton states, "approximately twenty minutes before the chase scene." The chase scene began at exactly 10:23 pm. 10:17 pm-- According to Tommy Skakel, from his interview on 10/7/93 [footnote 1] with Willis Krebs, this is the approximate time he joined Ken Littleton in the master bedroom to watch The French Connection-- approximately five minutes before the chase scene began at 10:23 pm. After the conclusion of the chase scene, Tommy said he went to the kitchen for food. 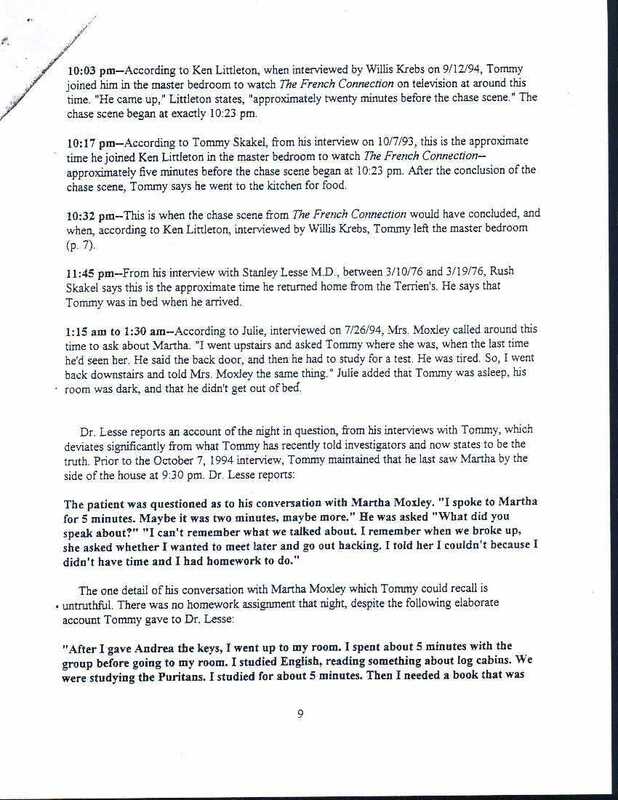 11:45 pm--From his interview with Stanley Lesse, M.D., between 3/10/76 and 3/19/76, Rush Skakel says this is the approximate time he returned home from the Terrien's[Terriens']. He says that Tommy was in bed when he arrived. 1:15 am to 1:30 am--According to Julie, interviewed on 7/26/94, Mrs. Moxley called around this time to ask about Martha. "I went upstairs and asked Tommy where she was, when the last time he'd seen her. He said the back door, and then he had to study for a test. He was tired. So, I went back downstairs and told Mrs. Moxley the same thing." Julie added that Tommy was asleep, his room was dark, and that he didn't get out of bed. The patient was questioned as to his conversation with Martha Moxley. "I spoke to Martha for 5 minutes. Maybe it was two minutes, maybe more." He was asked "What did you speak about?" "I can't remember what we talked about. I remember when we broke up, she asked whether I wanted to meet later and go out hacking. I told her I couldn't because I didn't have time and I had homework to do."